Where are all of my bride to be’s at?! With being a bride to be myself, I know how stressful it can be to find all of the perfect outfits for every event. From your engagement party, to your bridal shower, to your bachelorette party, to your rehearsal dinner, and onto your honeymoon. There are so many outfits to buy and how is a girl supposed to find that many cute, white outfits?! Well I did the hard part for you and searched all of my favorite retailers for the cutest white dresses, rompers, and playsuits, so you can sit down and worry about planning your wedding instead of searching for cute outfits to wear! Even if you aren’t a bride to be, these white outfits are perfect for spring, especially with Easter right around the corner. I linked 100 outfits and hope you find the perfect outfit! Simply click on the desired image where you will be redirected to shop the item(s). 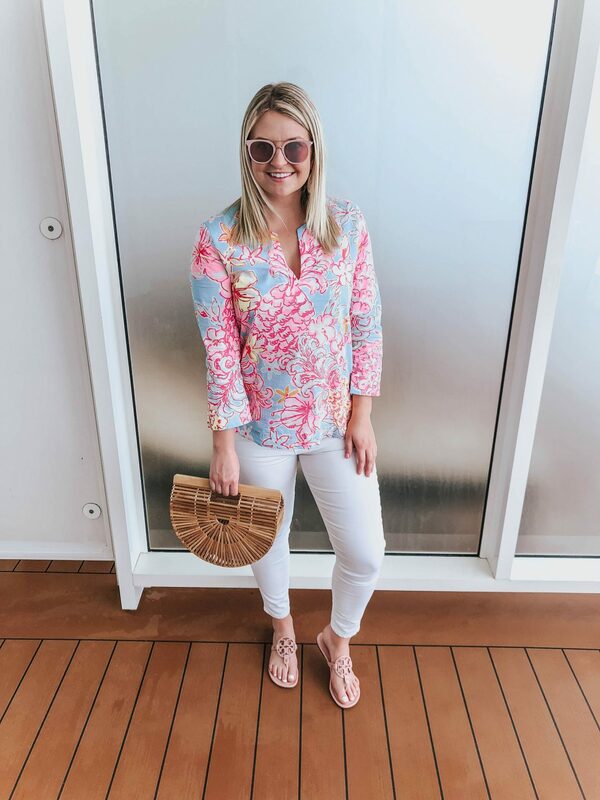 Spring break is right around the corner, which is why I am sharing all of my favorite swimwear of 2019! I will be going to three bachelorette parties within the next month so I stocked up on all of my swimmies this past month. I rounded up all of my favorite styles from a ton of different retailers, all with different price points, to meet the needs of all of your budgets! Whether you are going on a college spring break or headed on a luxurious spring vacation, there is a swimsuit for you. I linked 100 different swimsuits and I hope you love all of the styles I rounded up as much as I do! Simply click on the desired image and you will then be redirected to a separate page to shop the item(s). While it might not feeling like spring for some of us, including myself, all of the spring clothing and accessories have hit the stores in full force. I am so excited because I absolutely love spring and all of the bright colors. It’s so fun to transition into spring clothing after the long winter months. I have rounded up all of my favorite spring clothing, shoes, and accessories from a bunch of different retailers, all with a variety of prices (mostly everything I linked is affordable, with a few splurge items here and there). I wanted to save you all time from sifting through different retailer’s websites and put it all in one easy, convenient place. I took a few Instagram polls last week and asked if you were all interested in seeing clothing from Amazon or boutiques. The results were pretty 50/50 so I included items from boutiques, Amazon, and other retailers as well. All you have to do is simply click on the desired image where you will then be redirected to a page to shop the item(s)! This post is sponsored by Minted. All thoughts, opinions,and pictures are my own. Choosing save the dates can be challenging, especially when you know it is the first item your wedding guests will see for your big day. I first went to the Minted website and fell in love with so many designs. Minted has various designers with diverse selections to ensure every couple finds the perfect save the date. I was torn between having multiple pictures on the front of the save the date or just having one picture on the front. We ended up choosing a save the date that had one picture on the front with a collage of pictures on the back, along with text for details. 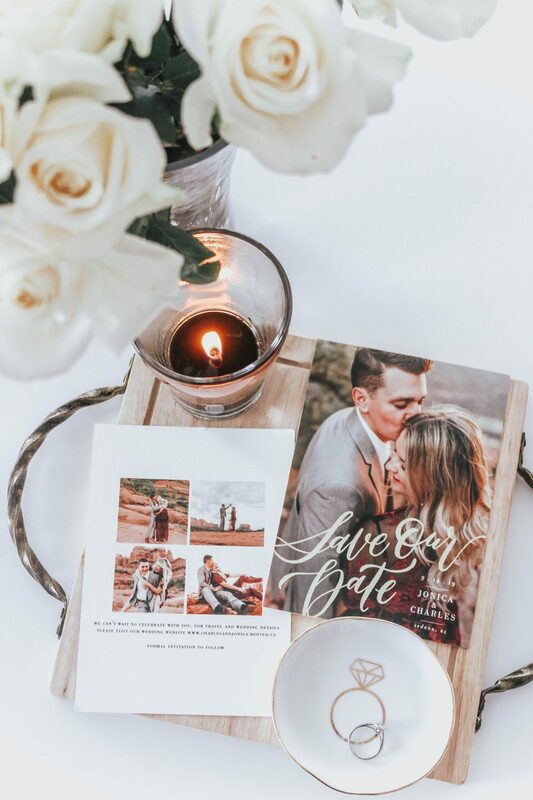 We also wanted a save the date that had gold foil on the front of our cards because we will have touches of gold incorporated in our wedding day, which is something Minted offers for many of their designs. The Minted gold foil is absolutely stunning and adds the perfect touch to every card. 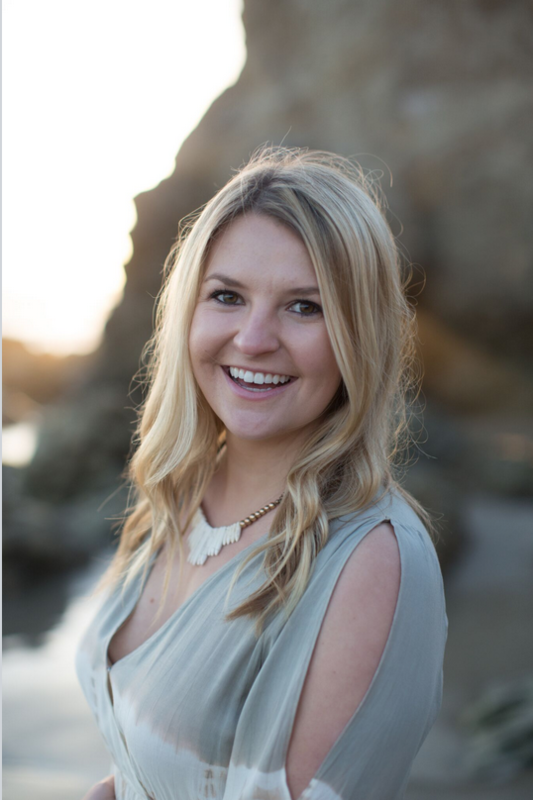 I love how user friendly the Minted website is, it makes ordering invitations simple and easy. 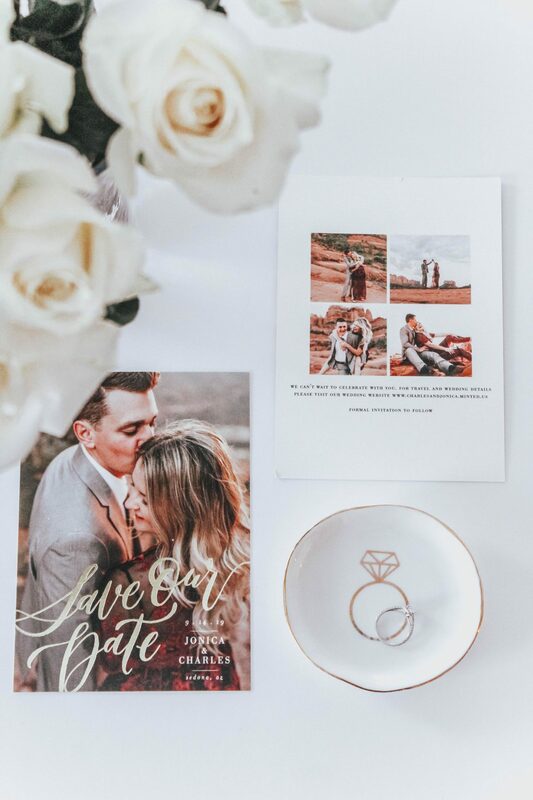 Once you choose the design you want, you can then customize your save the dates by choosing the card size, the quantity, the photo layout, whether you want to add gold foil text or not, the colors, the silhouette shape, the format, and paper type. Minted has so many beautiful paper types, including smooth signature, signature, recycled, pearlescent, doublethick, and triplethick. We chose the smooth signature paper and love the quality of the paper. You can also choose to print the artist’s mark on the back of your save the date to support the independent designer for your particular card. Once you choose all of your options, you can them customize your names, add your wedding date, add your wedding location, and anything else you may want to add to your save the dates. You then customize the back of your save the dates by leaving them blank, adding a design, adding pictures, or adding text with details. We chose to add a picture collage with our wedding website below. After customizing your save the dates, you then get to customize your envelopes by choosing white, speckletone kraft, or silver envelopes. You can also choose to add envelope liners to match your design. Next is my favorite part about the entire Minted process, it is honestly amazing… they will print all of your recipient addresses on your envelopes FOR FREE! Yes, you read that right, all for free. You can also choose to add your return address on all of the envelopes for $65 and custom stamps for an additional fee as well. Finally, you upload all of your addresses (I added mine by uploading an Excel sheet) and they do the rest for you, so simple and easy! Once you have your save the dates personalized to your liking, you pay for your cards and wait for your proof to be sent to your email. A designer will look over your design and make suggestions for minor edits to ensure your cards are flawlessly printed. I received my proof in less than 24 hours and appreciated the edits my designer suggested. We then received our save the dates the following week and absolutely love everything about our cards! Minted is currently having a sale until tomorrow, 2/25. 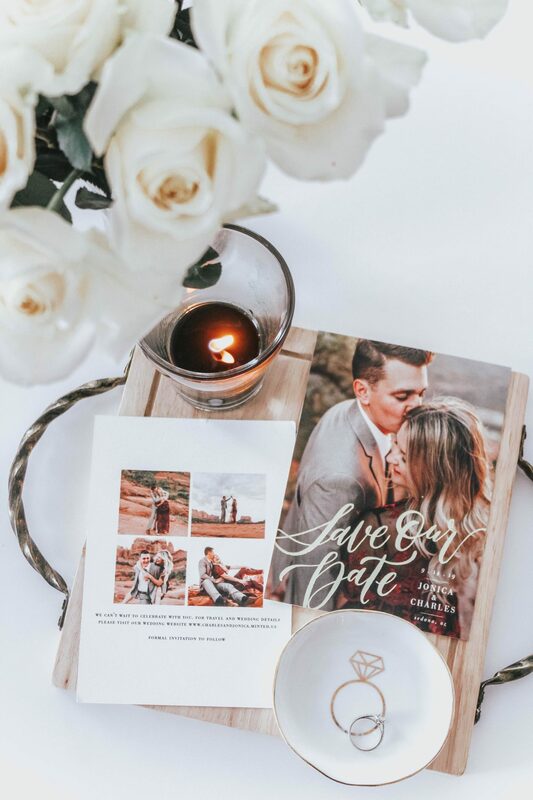 By using the code: FEBWED19 at checkout, you can receive 30% off of your save the dates! Click here to see all of the amazing Minted designs and start customizing your save the dates!